We are supine on the leafy forest floor. I stroke Billi’s head and fondle her ears; she runs her leathery black fingers through my hair, and into my pockets. Her silky fur smells clean and earthy; her amber eyes meet mine. But I’m out of peanuts, and lose her interest. Besides, she’s got trees to climb. 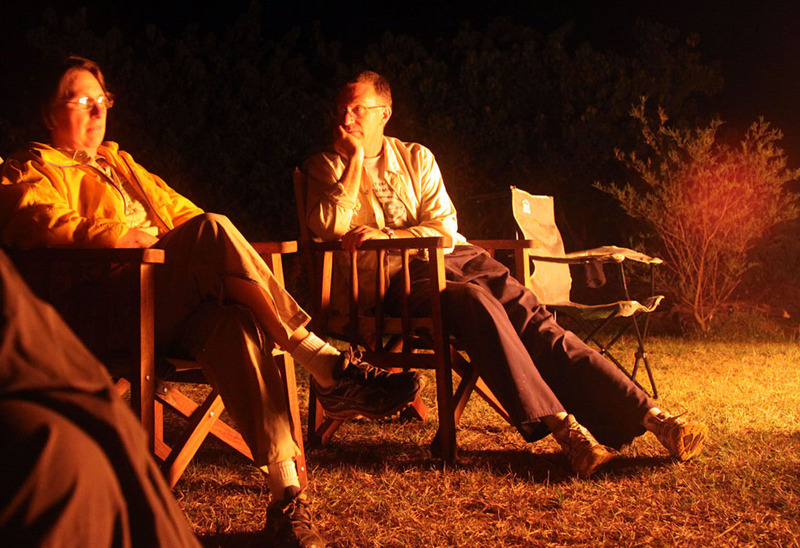 I’ve come to Uganda to be with chimpanzees, both in the wild, and here, as a sanctuary volunteer on Ngamba Island. 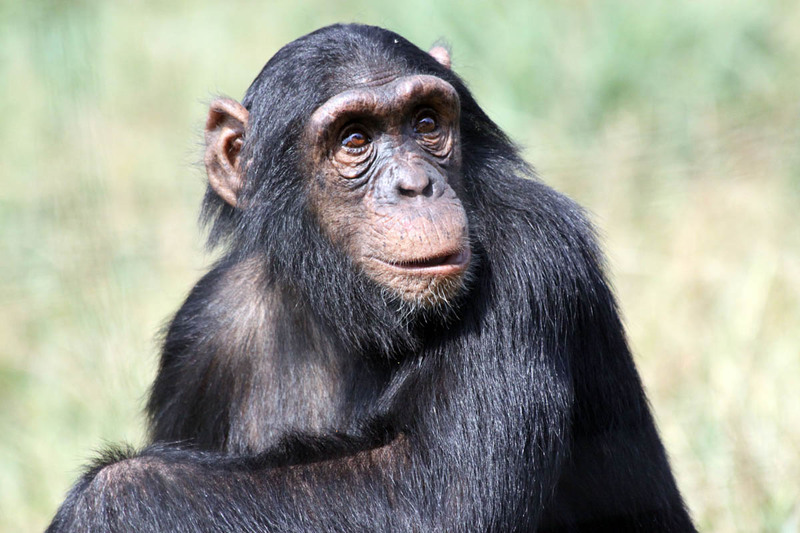 With human population growing and wildlife habitat shrinking, chimps are in trouble. This hundred-acre island on Lake Victoria is a refuge for just under fifty of them, confiscated from smugglers, hunters, miserable confinement. In 1998, an eco-consortium purchased Ngamba from its resident fishing community, and over time, installed solar power, water storage tanks, compost toilets, a vet clinic, accomodation for staff and visitors. 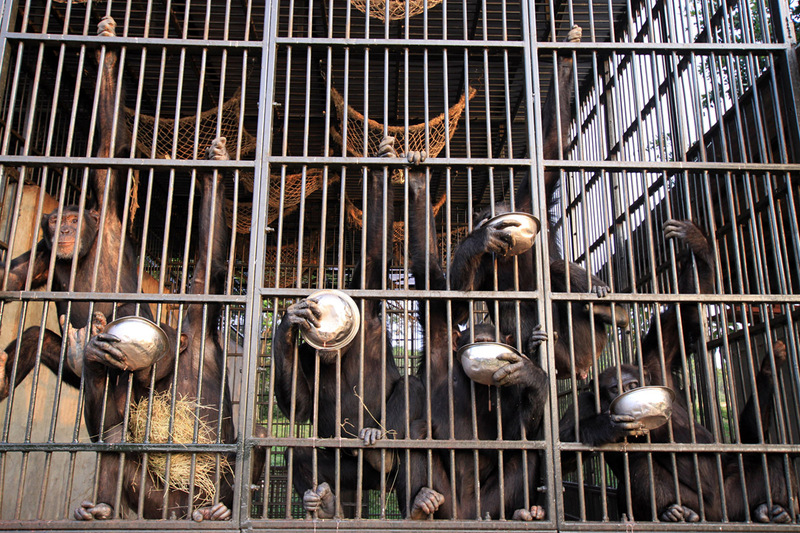 Night cages serve as a chimp dorm and holding facility. Thatched open-air dining and welcome pavillions serve guests. My home is one of several raised safari-chic tents at lake’s edge. An electrified fence separates this human enclave from forest, where rescued chimps roam, forage, and forge a new social order. Several times daily they return to a clearing for treats to supplement their diet. This is when visitors witness behaviors, and perhaps choose favorites among the troop. Early morning, when the chimps have left for the forest, is cage-cleaning time. A white carpet of egrets stabs at the shallows by my tent. I dress hurredly and galumph uphill through a gauntlet of slithering Nile monitor lizards, some as much as five feet in length, and fortunately, rather shy. Clad in green worksuits and rubber boots, we push across the soiled cages with poop brooms, gathering used hay, hosing and disinfecting the floors. The heat makes me think I’m working hard. The boat from Entebbe brings provisions, day visitors and school groups. 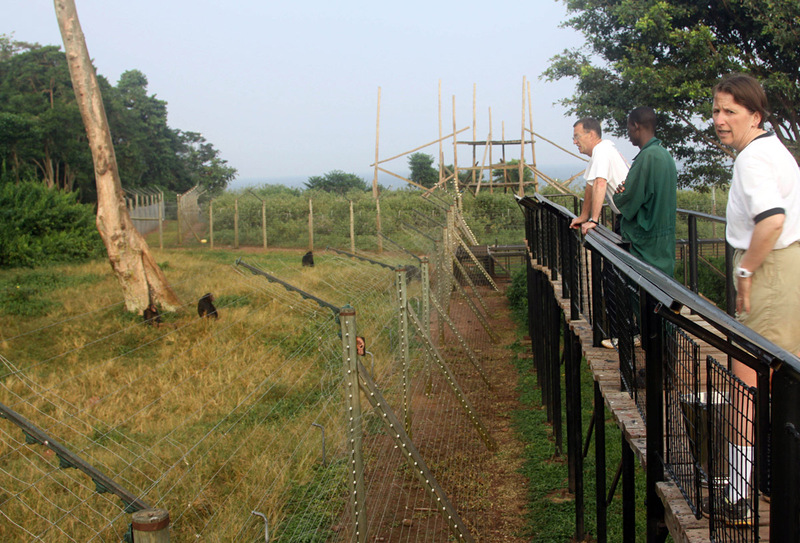 All pass through the welcome pavillion for Chimpanzee 101; a summary of crises facing primates, and Ngamba’s history. Then its on to witnessing feedings, birdwatching and exploring. Tourists headed for the lush parks of Bwindi or Mgahinda for gorilla tracking often include Ngamba in their itinerary. After cage-cleaning, staffworker Joseph teaches us KP, and volunteers Vickie, Scott and I begin Deep Chopping Mode. 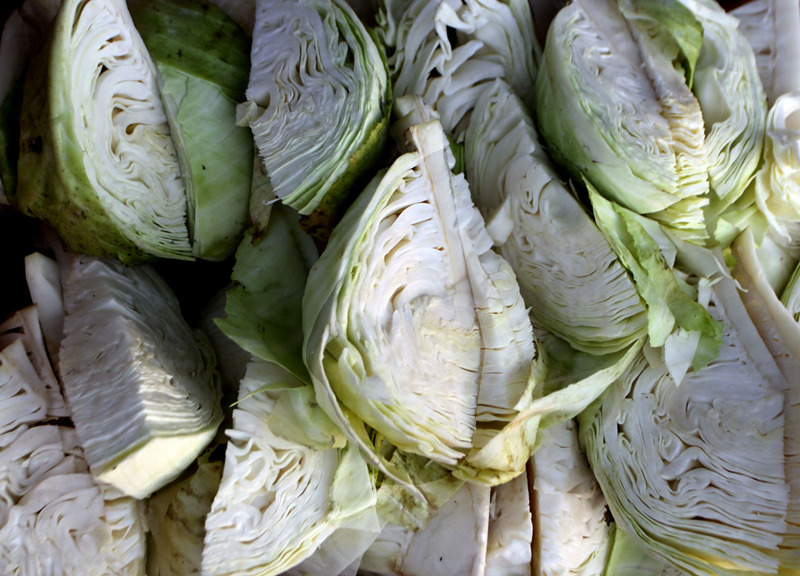 Mounds of fruits and vegetables; carrots, cabbage, and more, spill from the shelves. Pineapple and jackfruit juice drips down our aprons. With military precision, we chop and layer chunks into pails, then haul them upstairs to the viewing platform. On the grassy clearing below, the chimps have come in from the forest, and, arms raised like expert outfielders, position themselves to intercept the mango missiles, pineapple projectiles, carrot rockets, and cabbage bombs hurled their way. Piercing shrieks suddenly disrupt this fun game. Mika, fur bristling and canines bared, confronts Eddy, another huge male, and a chase ensues, round tree trunks and back. “If there are two chimps, one is boss,” says Stany Nyandwi, senior caregiver. Stany knows these animals like no one else, having smuggled some of them across the border from Burundi during dangerous times. Now he enjoys the “safe” physical access and affection that eludes the casual visitor. Then I spot my pal Billi, scooping lake water with a jerrycan found along the shoreline. Billi’s story, and those of all the chimps, is readable on plaques posted along the walkway. She’s come a long way since arriving, diseased and malnourished, in 2001. Before dusk, most of the chimps amble in from the forest to their holding pens, for porridge, more treats, and an armful of fresh straw to arrange in their sleep hammocks. Sanctuary staff, guests, and the occasional visiting scientist mix it up at dinner, exchanging primate gossip and tales of adventure. Holding wine glasses aloft, we traipse out into the darkness, in time for a swirling onslaught of bats on an insect safari. Before returning to my tent, I stop by the small office and library. A photo of Jane Goodall, whom I met at the onset of her research, hangs above the shelves of donated books, computers, notices and schedules. Now 82, Dr. Jane is the reason I’m here, why each of Ngamba’s chimps is named rather than numbered, and why sanctuaries exist for these amazing animals. Finally tucked under my blanket, I try some reading. Lilting music from Myende, where villagers from Ngamba have relocated, drifts across the waves. A mysterious creature scampers back and forth across my canvas roof. And abruptly, there’s a fracas; earsplitting shrieks, escalating in pitch and number, a howling back and forth. I rise from my pillow, straight-backed. 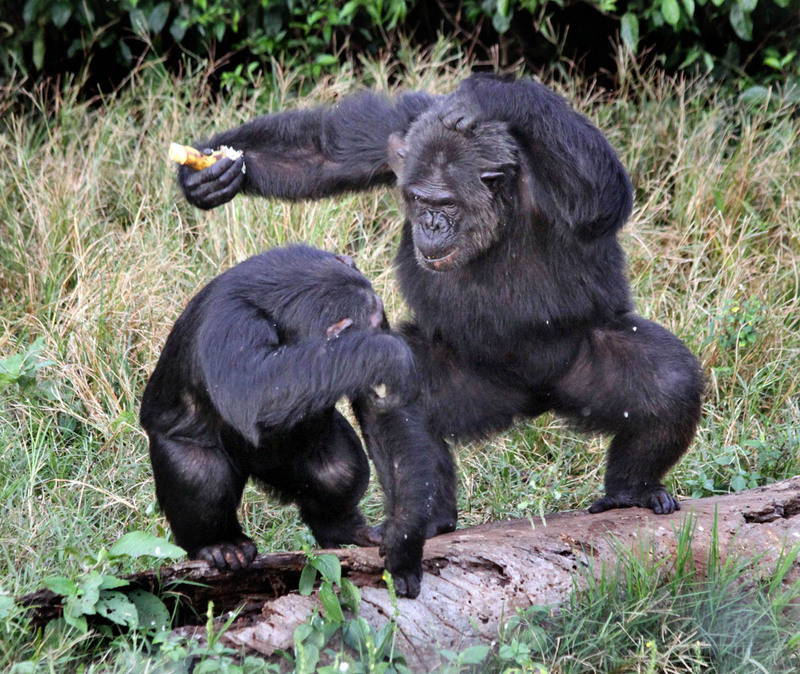 The chimps are having a skirmish, a row, about some secret we may never know.